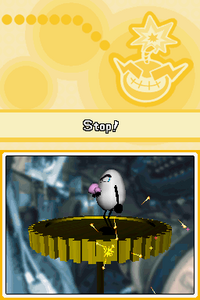 Scrambled Egg is one of Wario Man's microgames in WarioWare: Touched! and returns as one of Wario Deluxe's microgames in WarioWare Gold. 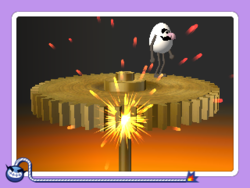 The objective is to touch the wheel and keep the stylus on it until it stops to make the egg with arms, legs and Wario's face fall off. 1st level difficulty: The wheel is turning in a fixed area. 2nd level difficulty: The wheel is turning and moving up and down. 3rd level difficulty: The wheel is turning and moving up and down in a random pattern. In WarioWare Gold, the wheel moves diagonally across the screen. This page was last edited on November 30, 2018, at 19:30.